Find out Quickly & Easily with RetirementView software. Easy to Learn Easy to Use Branded for Your Firm Professional PDF Reports RMD, 72t, Stretch IRA, Roth Conversion and more! Totally Turnkey Since 1995 Works on All Devices + Mobile Friendly Increase Website Engagement! Retirement, Investments, and more! “Keep It Simple” Retirement Planning for Everyone – Runs on Windows or Mac – “Fill-in-the-blanks” simple! So easy anyone can understand it, even if you aren’t that good with a computer. In less than 15 minutes, you can punch in basic data and have Retirement View generating meaningful and accurate retirement savings projections. Even more important, the easy-to-read charts display in “red” any projected shortfall. It’s also comprehensive. Unlimited investments. Unlimited cash infusions and income streams. Unlimited Expenses. 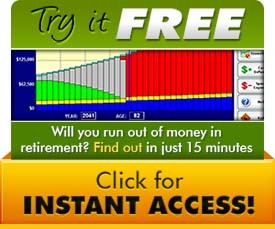 Great for: Individuals, Employees, 401(k) Plan participants, Financial Advisors, Insurance Agents, Brokers, Certified Financial planners, CPAs, Employee Benefits consultants, TPAs, Plan Sponsors, 401(k) Enrollment Meetings, 401k Education, 403b education, IRA savings, Financial Advisers, Registered Representatives. 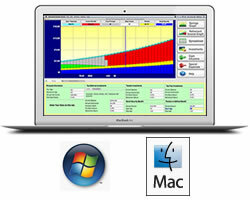 Retirement software that Keeps It Simple. Quit confusing your clients! Engage them in a LIVE conversation.